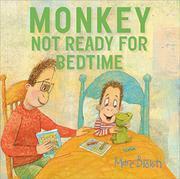 Brown’s anthropomorphic Monkey returns, and this time he’s not ready for bedtime. Conspicuously absent from this book is Monkey’s baby brother (from the earlier title Monkey Not Ready for Baby, 2016). But Monkey’s big brother and parents are present, and they all try to help him get to sleep. Alas, soothing nighttime routines fail to do the trick, and this ends up making Monkey feel tired at school. Brown’s accompanying watercolor-and-gouache illustrations in the school scenes show Monkey asleep at his desk, pencil in hand, and nodding off on a swing while a young lion friend looks on with concern. After seeing him fall asleep at the dinner table, Monkey’s brother encourages him to try counting things in his mind to fall asleep. At first Monkey doesn’t think this sounds very promising, but when he decides to count dinosaurs he ends up engaging in imaginative flights of fancy with many different dinosaurs, an activity that ultimately sends him to dreamland. Endpapers featuring those dinosaurs extend the story beyond the main narrative and hand-lettered text combines with a studied, childlike style to give it a friendly look, though little else feels particularly fresh about this bedtime book.